"Canadian illustrator Darren Rawlings imagined iconic vehicles from pop culture as autobots from the Transformers franchise. In this neat new series, cars like Herbie, Scooby Doo's Mystery Machine and the Dukes of Hazzard Gran Torino get the Transformer treatment. Back to the Future's Delorean autobot even has its very own hoverboard. 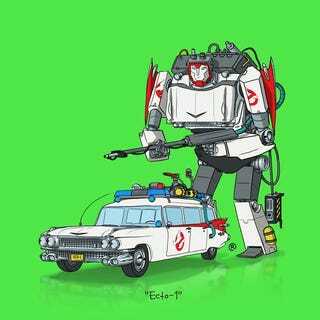 And in honor of the late Harold Ramis, Rawlings imagined Ghostbusters Ecto-1 as an autobot wearing its own, gigantic proton pack. For more of Rawlings' illustrations and animations, visit his website"
What cars did they leave out?